When first creating a batch you will have the ability to choose a setting for your batch. These options include not capturing this data, Sending this information to Amazon, or Saving the Min/Max information within InventoryLab. This option will automatically default to “Do Not Capture” until edited. After that, this option will default to the last choice selected. If you select to send this information to Amazon, the Min and Max Pricing information will be transmitted to Seller Central once your final feeds have been sent and your batch is complete. By Selecting Save to InventoryLab, this information can still be entered, but it will not be transmitted to Amazon. Instead, this data can be found under List>Closed Batches and can be Exported as needed. While Listing, you will see the option to enter this Min and Max Price directly below the List Price. 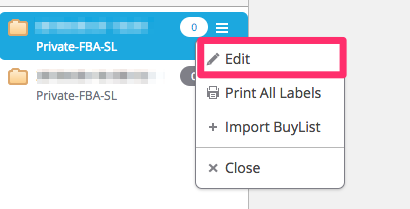 If you change your mind after creating your Batch, you can always click on the three lines next to your Batch name to edit this option. *Please keep in mind while entering this data that the Minimum price cannot be greater than the List price and the Maximum price cannot be lower than the List price. Once your Batch is complete, if you selected to enter this information, you can navigate to List>Closed Batches and change the View to “Pricing Details” in order to see the Min/Max prices entered, or export this information within a Closed Batch file or a BQool Repricing Central file. *The last Closed Batch View selected will be the default view. You can set up Auto-Price Rules for Min/Max to auto-populate the fields by navigating to Account Name > Settings > Auto Price Rules. You can also adjust these rules while listing by clicking the Pencils next to the Min/Max pricing fields. A popup will appear where you can make adjustments to your settings.